Professional Supplements Prosupps Mr. Hyde is a workout supplement that provides 40 servings of a fruit punch flavored powder containing powerful nutrients such as creatine hydrochloride and agmatine sulfate, which is designed to maximize muscle pumps during workouts. There is also caffeine for added energy and endurance. This pre-workout supplement is designed to increase energy and support muscle growth. You simply add one scoop of the powder to eight ounces of water and take prior to working out. 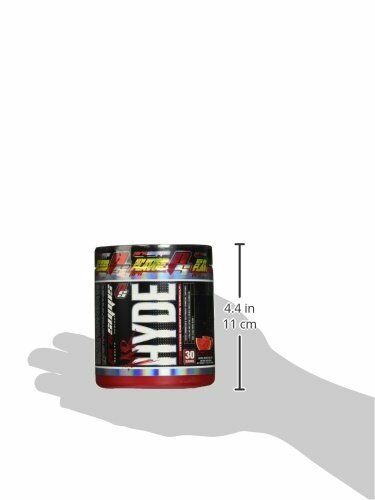 Prosupps Mr. Hyde 40SV has a list price of $59.99 but is currently sold on Amazon for $29.75 with free shipping. Composed of Three Parts -Strength Matrix, Caffeine Matrix and Intensity Matrix. Fruit Punch Flavor is pleasant Tasting. Increases energy and intensity of workouts. Agmatine Sulfate helps you get muscle swelling pumps from exercises. Convenient to take before workouts -mixes with water. Prosupps Mr. Hyde is a powerful supplement that can enhance the quality of your workouts. Unlike some supplements, you will probably feel the effects of this product immediately. Each serving contains two different types of caffeine, which not only makes you more alert but has been proven to increase endurance for exercise. This is the Caffeine Matrix portion of the product. The Strength Matrix is composed of several nutrients that support strength and muscle growth. Creatine is taken on its own by many athletes and bodybuilders due to its ability to enhance performance in many sports. Agmatine sulfate helps provide the muscle pump that bodybuilders are always seeking. Beta alanine is an amino acid that supports energy and explosive power during workouts. L-leucine is an essential amino acid that increases endurance and helps to maintain healthy blood sugar levels. It also supports human growth hormone production in the body. Prosupps Mr. Hyde also adds another factor, the Intensity Matrix, containing several important nutrients. Picamilon, also spelled pikamilon, is a supplement that was developed in Russia that combines niacin and GABA. It is known as a nootropic, which means that it enhances mental functioning by increasing blood circulation in the brain. This help you focus on your workouts and maintain high motivation. Also in the Intensity Matrix is n-methyl tyramine, a compound that supports energy and fat burning. The above are just some of the powerful ingredients found in Prosupps Mr. Hyde. Overall, this supplement contains a large diversity of nutrients that support energy, muscle growth and cognitive function. It would be difficult to duplicate the effects of this product without buying dozens of separate supplements and spending quite a bit more money. Even then, you would not get the synergistic effect that comes from taking these products together in one supplement. Like most supplements, Prosupps Mr. Hyde 40SV is not ideal for everyone. The manufacturer warns that this product is meant for advanced exercise and supplement users only. It should not be taken by anyone who is pregnant or who has health conditions such as heart disease, high blood pressure or diabetes. If you have any chronic health conditions or if you take prescription medication, you should consult with your doctor before taking this supplement. Assuming you are in good health and are someone who works out regularly, Prosupps Mr. Hyde is a safe supplement to take. However, some people who are sensitive to caffeine or other stimulants may find that it’s too intense. You should avoid other substances that contain caffeine, even coffee and soda, if you’re taking Prosupps Mr. Hyde every day. Because of the caffeine content and concentrated nutrients, you should never exceed the recommended dosage of this product. Prosupps Mr. Hyde 40SV is a powerful pre-workout supplement that can provide you with many benefits if you work out regularly. It’s a convenient and good tasting powder that you can take fifteen to thirty minutes before a workout and notice an almost immediate difference. The variety of ingredients combine to provide you with energy, endurance, fat burning capacity and maximum muscle pump. This makes it a supplement that’s very useful for helping you achieve many different fitness goals, whether you want to get stronger, build muscle mass, increase endurance or burn fat. This is a good product to take if you want to only take one supplement and not have to worry about buying lots of separate ingredients. For example, many athletes and bodybuilders take creatine, l-leucine, beta alanine and other ingredients found in Prosupps Mr. Hyde. If you take this before your workout, you probably won’t need anything else. Like any supplement, you have to determine if Prosupps Mr. Hyde 40SV is right for you. As mentioned, if you are very sensitive to stimulants, you will probably prefer a supplement without so much caffeine. On the other hand, for people who aren’t bothered by this, the reviews for this product are quite impressive. Prosupps Mr. Hyde is taken by many people around the world who attest to its effectiveness.